Hi Everyone! This is Holly, here with my last post for 2012! This sentiment works well for New Years' Eve. 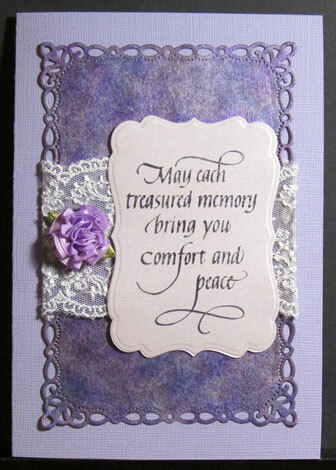 I paired up gold pebble metallics paper with a couple colours of purple card stock. The gold circles were cut using Spellbinders Circle Dies and Spellbinders Nestibilities Stars were used to cut out the stars, gold and purple. Picot Circles dies cut out the layers for the sentiment. White ink was sponged around the edges of the card but wasn't coming up strong enough. I used a white gel pen drawing along the card edge about an inch at a time and smudging with my finger to blur it a bit. The metallic paper is so rich- this gold is gorgeous! The stacked stars provide the stopper for the easel card. Thank you for stopping by and having a look. There is so much more to come in 2013! Have a safe and happy New Year and we'll see you here again. Hi Y'all, Monica here today. One of the hardest cards for me to make is a condence card. Fortunately Quietfire Design has an excellent stamp for this purpose. The background layer was created using Alcohol Inks, Stream and Wild Plum, Alcohol Ink Mixative, Silver, Alcohol Ink Applicator and glassine paper. Stamp saying, May each treasured memory bring you comfort and peace, on lavender Stardream text-weight cardstock with Archival Ink, Jet Black. 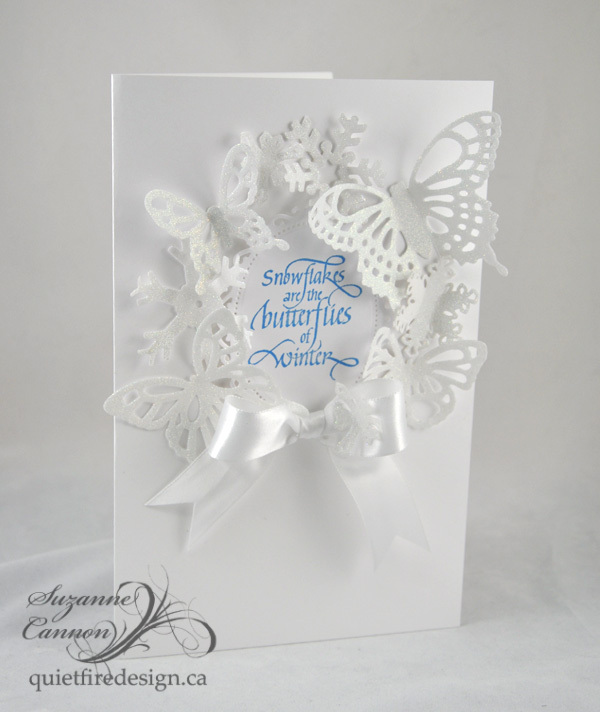 Cut out layers using Spellbinders Labels Seventeen and Romantic Rectangles. 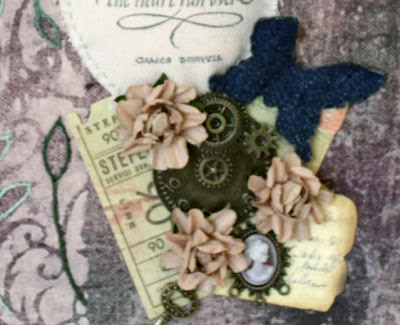 Add a bit of lace, a ribbon flower and attach to a 5x7 card made using Core'dinations Roy B. Giv cardstock with Be Creative Double-sided Tape. Sending wishes to all for a safe and happy holiday season. Hello Everyone, Terre here with a canvas project created using Quietfire Designs amazing stamps. For this canvas project I used several different products including "We Cannot Tell the Precise Moment" stamp, it just fit so perfectly for this friendship canvas. 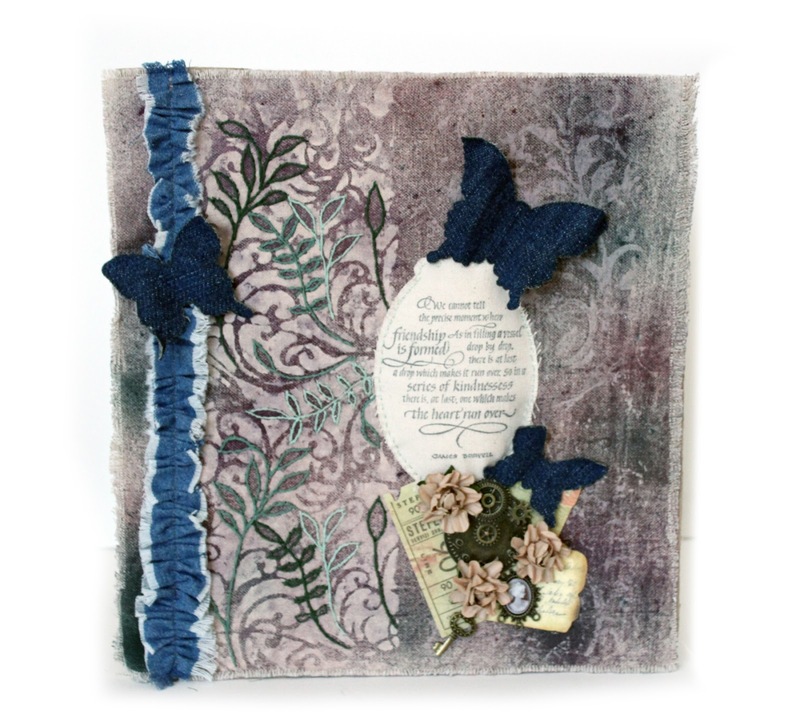 I used several Spellbinders die templates and guess what you can find them right here at Quietfire Designs, Botanical Swirls Expandable Patterns die template, Wonderful Wings die template and Labels Ten die template. I stamped my sentiment on my canvas die cut label using a dye based ink added some embellishments, spritzed my canvas with Glimmer Mist and used the Botanical Swirl die cut out of chipboard as a stencil and painted the pattern on my misted canvas. 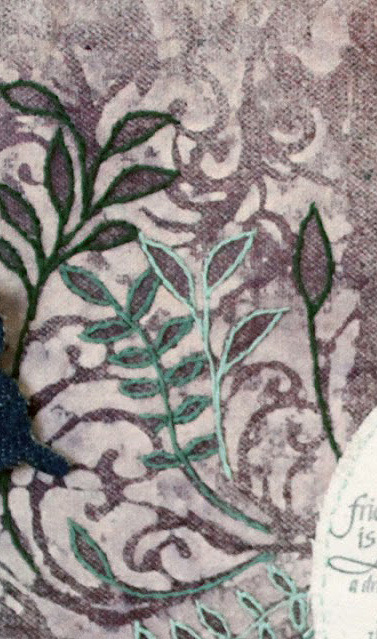 To add some dimension I hand stitched using DMC floss the pattern of the leaves from the Botanical Swirls die template. It's Suzanne here today to wish you a very Merry Christmas and a Very Happy 2013! All the best from Quietfire Design to you this holiday season. Here are some thumbnail links to the products I used. Then, my Father in Law died and I'm scrambling to find a flight 600 miles north, and then we get a big storm and power is gone. So I'm writing this on the road and it may be spare of detail. 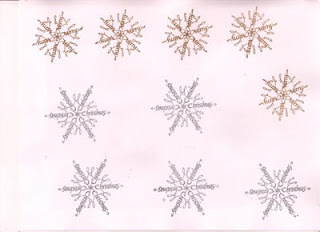 I used Spellbinders Resplendent Rectangles and the T!m Holtz snow flake rosette dies, the new gold and silver metallic Distress stains, lots of stardust pen and lots of love. Above is a close up of one of the panels and the rosettes. Some Stickles Glitter glue is in evidence! I've been looking for a use for this gold tree ribbon for years! Rest in Peace Pop Pop, and may the whole world pause in whatever they are doing tonight to pray for Peace for all beings. There is an shout out with more details to my Dear Friend SaraJean on my blog here. I just love how this turned out. I love the colours - and lack thereof! 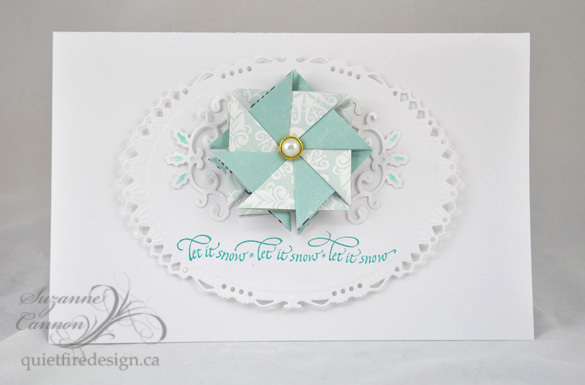 This is one of the medallions designer Sharon Reinhart teaches in her online class, Fabulous Paper Folds. I left the teabag folded "snowflake" pretty puffed up and added the simple pearl to the middle. 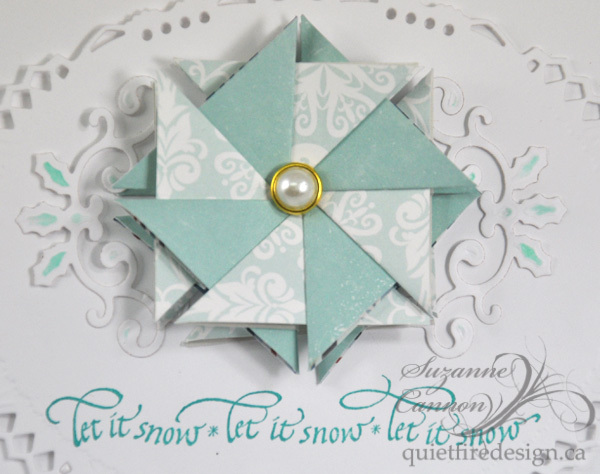 Let it Snow was stamped with Versa Magic Turquoise Gem, but the shading on the Holly Motif was done with the lighter coloured Aquatic Splash. 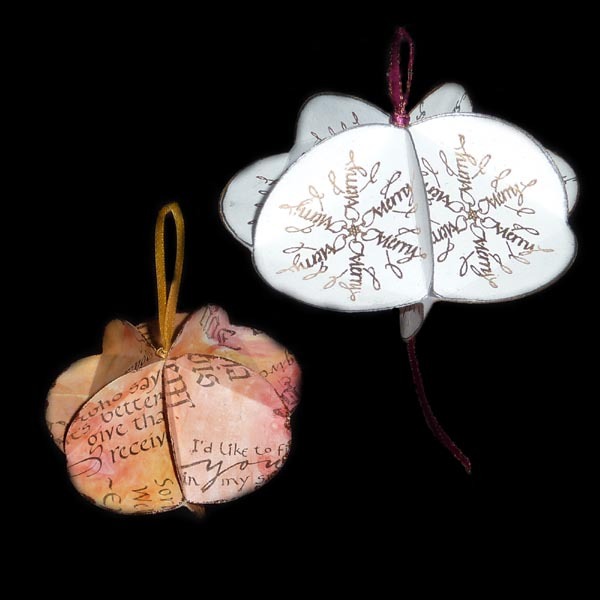 I use Echo Park's Winter Park paper for the teabag snowflake. Thanks for having a look today! Here are some thumbnail links to the products I used for this card. If the link doesn't work, the product may be sold out. It's Yogi here with my last post for the year... Thought I'd make something a little different than my usual cards. 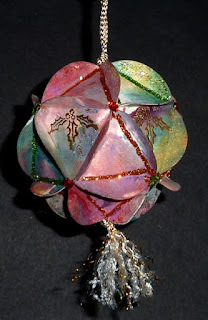 It's a really easy ornament to make and uses 10 circles punched or die cut. 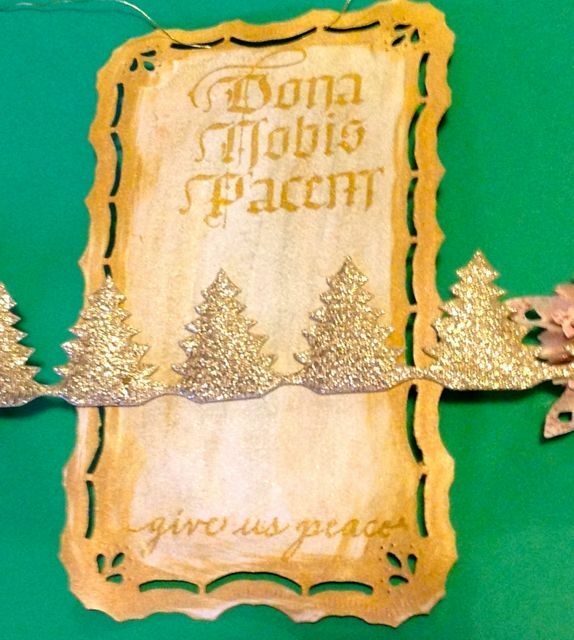 The more involved ornament below, uses 20 circles. Have fun. 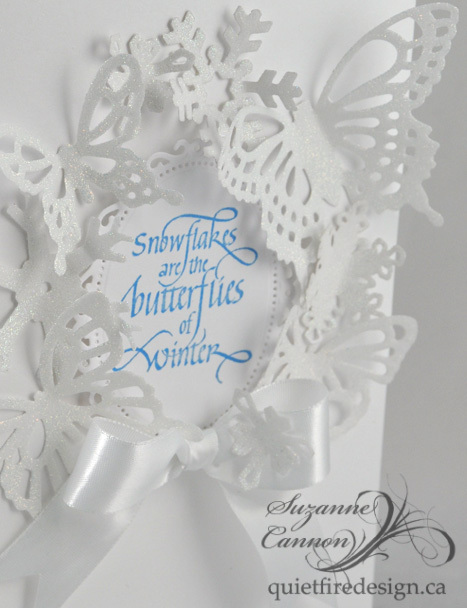 In photo "A", the ornament on the right had the snowflake words stamped and embossed in gold or silver on white 67# cardstock, with plenty of space between the stamping to then die cut with the Spellbinder's circle die - see image at below - Dia "A". In photo "A" again, the ornament on the far left had the abstract background made first on some glossy paper using various Xmas stamp sentiments and quotes, just filling up the background, spraying with Dylusions sprays and some water and drying, then die cut with a Spellbinders circle die. After die cutting, each circle was scored using a clear plastic stencil (see scoring template link above) and then folded on the score lines. When all were scored, the flaps were adhered to each other. Apply some glue (glue stick or some white glue) on ONE flap only (on the undecorated side). Adhere to a flap on the next circle. On this circle apply glue to a flap and adhere to the third circle. Continue to fifth circle, then adhere the fifth circle flap to the first circle flap. See Dia "B"
Repeat for the bottom section. At this point you can attach a string or ribbon and adhere to the inside of the top part of your ornament. Or you can wait to finish the ornament and punch a hole in one of the flaps and tie your ribbon. Adhere the two sections together, by gluing one flap from the top to one flap from the bottom, then the next one and so on till all have been glued together. For the more involved ornament you will need 20 circles, Follow instructions as above for 10 of those circles. With the other 10 you will adhere in this configuration below. Then adhere the last flap to the first flap to make a ring. Then adhere the top and bottom sections to the center piece, one flap at a time. On the more involved ornament, the circles were die cut first. 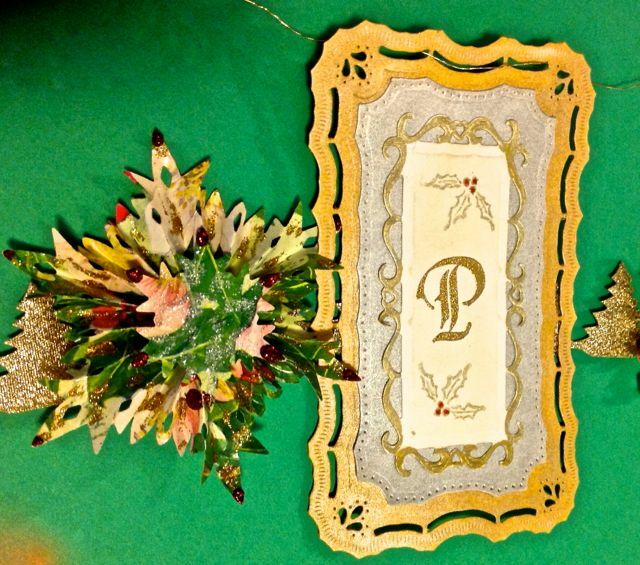 On a craft sheet apply splotches of Distress colors - Picket Fence, Worn Lipstick, Evergreen Bough, Scattered Straw. Smoosh your circles through the splotches and dry. 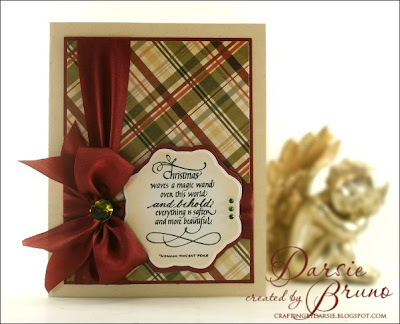 Stamp the flourished holly with Versafine Toffee and emboss with Queen's Gold. Finishing touches, add glitter to the outside edges of each circle, or along the creases of the circles. Adhere rhinestones or pearls to the junctions of the circles using some Golden's gel medium. It's seven days til Christmas!! Have you finished your shopping? With all the hustle and bustle of the season, make sure you take time to reflect on the true meaning of the holiday. 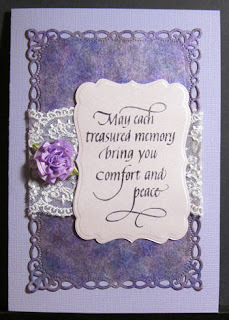 I love the sentiment I used for my card as it has a wonderful message! 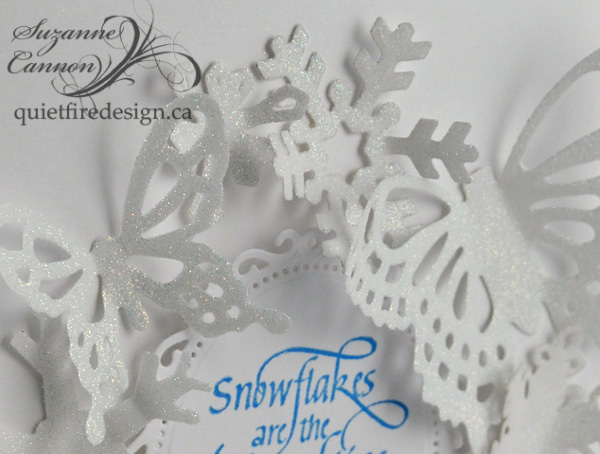 The stamp is called "Christmas Waves a Magic Wand" and it's just one of many fabulous sayings that Quietfire Design has in their store! Wishing you and your families a Joyous Christmas and a Prosperous New Year! Hi Everyone! Holly here with an idea or two for giving gift cards this Christmas. 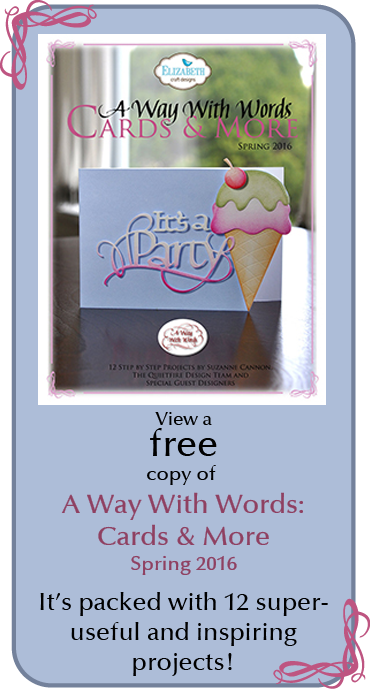 I have two styles to share and I believe they can easily be adapted for birthdays and other occasions. 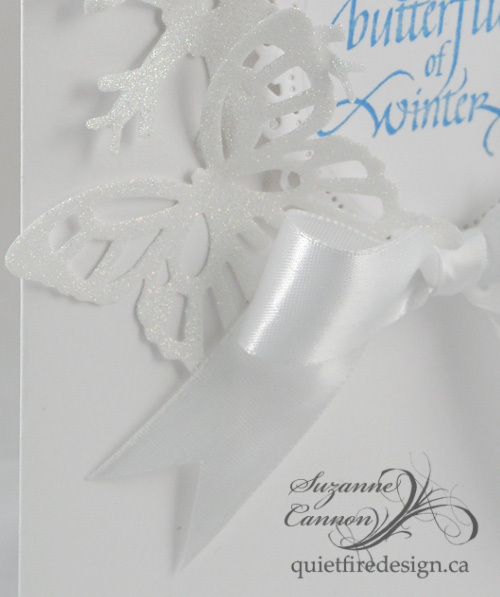 Both gift card holders use the Snowflakes are the Butterflies stamp set. The ornament shaped one also uses the Deck the Halls , Christmas Cuddlers , Rejoice and Hallelujah and Textured Holiday Words stamp sets. 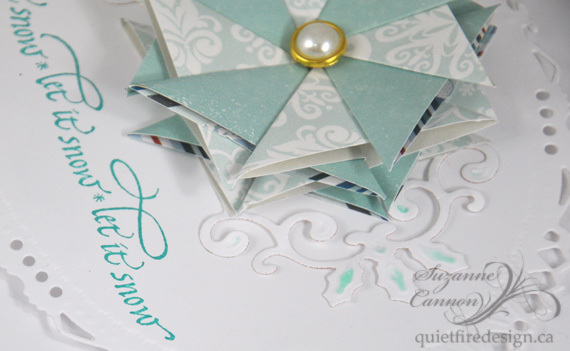 The scalloped square one also uses the Flourishes 1 stamp set. Both gift card holders use a brad hinge to allow the top to swing aside to show the gift card. This one uses two slots cut into the paper to hold the card. This card holder has a pocket to hold the card. Distress Inks were used for all the stamping and sponging around the edges. There are no limits to the shape you choose as long as it's large enough to hold the card. The pocket requires a larger design, whereas the slot design allows for a smaller shape. This can be presented as a card or hang it on the tree as an ornament. Here you see the top 'leg' of the brad rolled with round nose pliers to create a hanging loop. My next post will be after Christmas, so I'd like to extend my best wishes for a very Merry Christmas or Happy Holiday season. May you stay safe and be happy!